This week's edition of Sunday Sound Effects Round Up has a largely Ambisonics them to it. We start with our own unique deal with a 45% discount on the Pro Sound Effects Ambisonics Bundle. Next, A Sound Effect is offering an Ambisonics sale and some free Ambisonics sound effects to celebrate the largest online Ambisonics SFX collection. Unidentified Sound Object Libraries have released two new Ambisonics sound libraries and a 3rd MS recorded library, the proceeds of which are going to UNICEF Mexico to help with the recent earthquake. Then we take a look at new libraries from Robert Kubicki, SoundBits and Pro Sound Effects and finish up with a Pro Tools Expert community 20% discount on Suburbia from Smackheads. 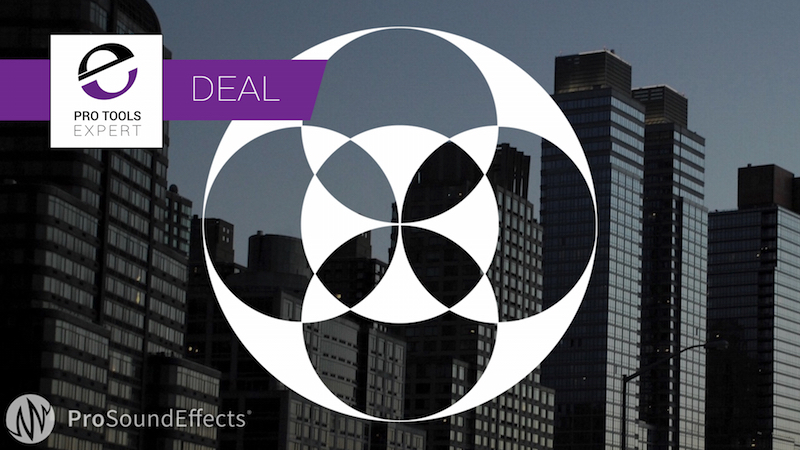 For the whole month of September, Pro Sound Effects are offering the Pro Tools Expert community their amazing Urban Ambisonics bundle at a 45% discount, making it $199 instead of the usual $360. I reviewed the Pro Sound Effects NYC Ambisonics library back in 2015. Since then this bundle has been expanded to include full Ambisonic effects from Chicago, Tokyo and Shanghai as well as New York. Ambisonics sound effects are so versatile in multi-channel production as they can be converted into formats like binaural, 5.1, and 7.1. This is a great opportunity to kick-start your multi-channel sound effects library. Following on the Ambisonics theme, A Sound Effect has announced that with the addition of several new Ambisonics sound libraries they are claiming that they have the largest and most diverse Ambisonic sound repository in the world. A Sound Effect’s curated collection covers everything from water and wind, through to crowds, applause, parks, building interiors, ventilation, and even bugs! To celebrate the new sonic arrivals, A Sound Effect is giving away 2.9 gigabytes of Ambisonic sound effects (41 files - 68 minutes) free during a limited, one-week only promotion until September 26th 2017. Alternatively, they are offering some great discounts on the Ambisonics libraries on their site. To check out what they have on offer there is a dedicated page of Ambisonics libraries on special offer. As a location recordist, sound designer and re-recording mixer focused on cinematic VR, I'm absolutely thrilled that A Sound Effect is offering this large collection of ambisonic recordings. Not only are ambisonics the de facto surround format of choice for fixed POV ambiences and scene-based recordings but it can also be extremely useful for far-field interactive audio. Because it feels so natural, I find that it really helps to "glue" a scene together. Paired with head-tracking, it allows for unparalleled immersion. Headspace Studio was recently involved in the VR/360 production of The People’s House: Inside the White House with Barack and Michelle Obama which received a Primetime Emmy Award for Outstanding Original Interactive Program. Part of the appeal of Ambisonic recordings is their inherent flexibility to be modified to fit a particular scene. If an ambience is not in the correct position sonically to match the image, it can easily be repositioned, almost as if the editor was able to go back in time to rotate/tilt the original microphone placement. With VR and 360 content, the latest headset technology can track the viewer’s head position and dynamically rotate/tilt the sound as they look around. A truly unique feature of working with Ambisonic audio is the ability to modify the sound during post-production. Editors can reposition the original sound left, right, up and down to most closely align with the on-screen visuals. All Ambisonic libraries available at the A Sound Effect webstore contain the original A or B-Format sound files which can be manipulated and customized during post-production to create 5.1 or 7.1 surround SFX, as well as convenient stereo versions using a free plug-in readily available for most audio editing applications. 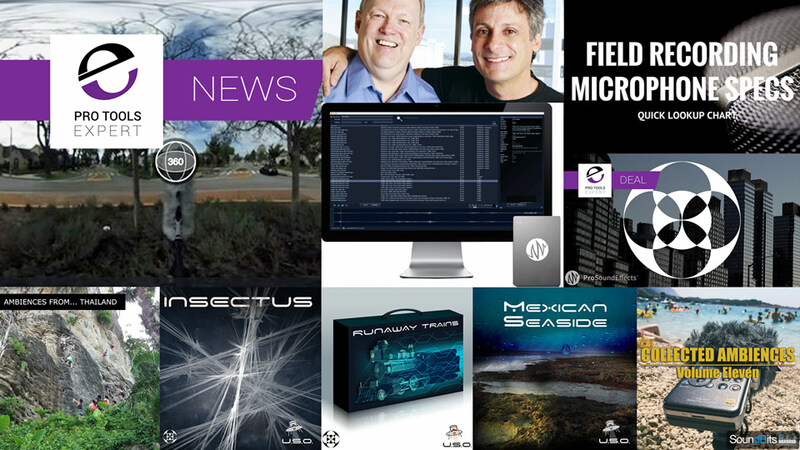 USO Libraries have contributed a number of Ambisonics to the A Sound Effect Ambisonics portfolio with 2 new releases, Insectus, and Runaway Trains with their 3rd release, Mexican Seaside going to support the UNICEF Mexico Earthquake relief fund. Insectus has been in the works for more than a year with a lot of experimentation in that time trying different approaches to find the best way to deliver this bizarre package of sounds. It’s not a ready-to-go ambience collection, they have called it Insectus not only for its Latin roots, but also because it comes from the fusion of two words: Insect+Tinnitus. They have used the higher octave of the spectrum in an odd way, mimicking insect vocalization and biophony sounds in Symbolic Sound Kyma by layering a lot of synthesised stream of small bands of very high frequencies. There are 100 x 30" loopable variations of FOA FuMa/ambiX interleaved files (4 channels).Try creating a soundscape by layering, rotating, expanding and shrinking the FuMa/ambiX file. You can also re-construct the 360° sound panorama from binaural up to 7.1 surround. Runaway Trains was recorded with a Sennheiser Ambeo and a Sonosax R4+ in and around the Milano Greco Pirelli railway station, which is part of the so-called “Milan Circle Line,” a railway loop which circumnavigates the city. The library contains a lot of passing trains and ambient sounds recorded very close to the railway, both by day and by night. There has been no further processing, although we did carefully remove all the Italian P.A. announcements, to make life easier for the editors during the sound montage. They have also included a useful bonus. You will find some ready-to-use backgrounds as “airfill” between the passing trains to create continuity in a longer scene if need be. The ambient sounds are also great as a standalone! Mexican Seaside is a unique Mid-Side collection of ocean sounds gathered during the summer of 2017 in the Yucatán Peninsula – Mexico. It contains sandy and rocky beach ambient sounds, with no human activity. These sounds were recorded at sunrise (on various days) with a Zoom H6 on a Joby GorillaPod and a MS capsule (MSH-6) covered by a Rycote Mini Windjammer. Ambiences from Thailand is a collection of sounds from busy and exotic Bangkok, idyllic Railay Beach and Khao Sok with oldest evergreen rainforest in the world. You will hear tourists’ excitement, local Thais conversations, traditional gongs at world-famous temples and cricket chirps and other insects in middle of the night. Additionally, you will find soundscapes generated by Asian means of transportation: boats, tuk-tuks, buses and planes. Each library of the “Collected Ambiences“ series features 33 various Stereo Ambiences. All recorded with Sound Devices 744T, Sonosax SX-R4+ (from Volume 09), Sennheiser MKH8040 ORTF, Sennheiser MKH8050 + MK30 MS, Beyerdynamic MC930 ORTF, RODE NT1-A, RODE NT4 or Sony PCM-D100. Volume 11 contains sounds from the Beach, Public Space, City, Rain, Wind, Weekly Market and Bistro and each file has detailed BWF Metadata. The Odyssey Collection: Essentials is the first exclusive sound effects library from our partnership with award-winning sound editors Mark Mangini & Richard L. Anderson. Odyssey Essentials is a general library featuring over 16,000 sound effects curated from Mangini and Anderson’s private collection of recordings. These sounds were crafted daily and painstakingly over decades-long careers working on blockbuster films like Edward Scissorhands, The Fifth Element, Aladdin, The Green Mile, and Anchorman. Unlike most general sound effects libraries, all sounds in Odyssey Essentials were created to fulfil specific needs and challenges for over 250 feature films – all expertly captured with the resources of a Hollywood budget and commitment to sonic excellence. Odyssey represents 30 years of passionate pursuit of something I love to do, for the sake of doing it. We recorded because we had to, not because we got paid to – the movie needed it and we did what was necessary. This library has been instrumental to our own success, and now the sounds can live on in the hands of the next generation of filmmakers and sound designers. Price: Normal price will be $1495, but there is an introductory price of $895 for a limited period. Back in August in an earlier edition of Sunday Sound Effects Round Up we featured a new library from Smackheads entitled Suburbia. Mark Brandis from Smackheads has been in touch to make an exclusive 20% discount offer to readers of the Pro Tools Expert Sunday Sound Effects Round Up on his new Surburbia Sound Library. Suburbia covers a variety of locations, from quieter suburbs with a gentle breeze, a distant dog, some crickets perhaps and maybe a few birds, to the more densely populated areas, where the traffic and background noise is much higher and some construction is always going on. There some nighttime stuff in there, some ocean side, some with nature at its finest and even lawnmower and whipper snipper recordings so you can layer it all up. All recorded at 24bit/96kHz, the library is 2.5GB and contains 36 tracks. To take advantage of the exclusive 20% discount then go to the Smackheads site, buy the Suburbia library and use the coupon code SUBURBIAPTE to get your 20% discount. Paul Virostek was trying to find a microphone for a parabolic dish. He wanted a low-noise omnidirectional microphone under $1,000. He looked in the regular forums. He browsed Facebook. He popped in and out of manufacturer websites. He found that it took a lot of time to compare and contrast mic models, current prices, and technical specifications and so he thought "There must be an easier way to do this". So, rather than jump on a forum and moan about it he decided to step up to the plate and to create a list of popular microphones for everyone to explore. He acknowledges that not every microphone is listed, he has focused on popular field recording microphones. You can learn more about Paul's Field Recording Microphone Specifications Quick Lookup Chart on his Creative Field Recording blog as well as download the chart in a variety of formats.